It's here at last, the New Year's Eve ! The day most people look forward to for enjoying with friends and family by bidding goodbye to the year gone by, and welcoming the New Year with much fanfare and celebration. The celebrations of course are not solely confined to the US and are fancied throughout the world. In the US however, the restaurant fraternity have a hectic time : they have their sales targets to meet and are on the upfront when it comes to wooing customers. The year-end is celebrated on two days: the New year's Eve on the 31st of December and the New Year's Day, on the 1st of January of the coming year. Most office goers start celebrations after office hours on the 31st,which for most continue the next day as well. In most cities, many offices announce 1st January as a holiday to respect the 'hangovers' of their employees following the celebrations the day before ! According to popular folklore, if the follpowing foods are eaten on New year's Day, they guarantee good luck throughout the year. Peas or beans symbolize coins or wealth. Choose traditional black-eyed peas, lentils or beans to make a dish seasoned with pork, ham or sausage. Greens resemble money, specifically folding money. Make dishes using boiled cabbage or sauerkraut, collard greens, kale, chard, mustard greens, turnip greens or other green, leafy vegetables to ensure good fortune for the coming year. Pork is considered a sign of prosperity in some cultures because pigs root forward. This is probably the reason many Southern New Year's Day dishes contain pork or ham. Cornbread might symbolize gold, and besides, it is essential with black-eyed peas and greens. In other cultures, fish, grapes, and ring-shaped cakes or doughnuts or cakes with special treats inside symbolize luck. Spicy Southern Black-Eyed Peas Recipe: Salt pork, hog jowl, or ham hocks flavor this tasty dish of black-eyed peas. Crock Pot Black Eyed Peas and Collard Greens: This slow cooker dish combines the peas and greens with bacon and a tasty broth mixture. Crock Pot Red Beans and Rice With Andouille Sausage: While black-eyed peas are traditional in the South, beans and lentils are eaten on New Year's day in other cultures. Mustard Greens with Ham Recipe: Ham seasons these greens perfectly. Serve them with pepper sauce or a homemade pepper vinegar (instructions included). Southern Turnip Greens With Ham Shanks: Ham shanks or diced ham season these tasty turnip greens. Boiled Cabbage With Bacon: This is a flavorful alternative to Southern greens. Or serve your dinner with a creamy coleslawor cabbage salad. Pulled Pork Recipes: Serve tender shredded pulled pork along with your New Year's Day dinner. Classic Southern Cornbread: This golden cornbread is a great choice to serve with peas or beans. Or bake this cornbread with corn kernels. The corn is said to symbolize coins. Down Home Fresh Peach Cobbler Recipe: This Southern favorite will finish the meal nicely. Quite the obvious choice in menu display, particularly for Quick Service and Full Service restaurants at the Point-of-sale locations, apart from advertising in the social media sites. With Christmas celebrations preceding just a week ago, the in-store decorations could remained unchanged save for those added banners with 'Happy New Year' prints and a few more color balloons and trinkets. An ideal opportunity for branding. A catchy name or phrase could be given to the pork, ham, bacon dishes which would jell with the restaurants name. This would also be an investment as the customers will come in for repeat orders with the mention of the branded ham or pork. The items should be clearly listed on the menu board as the bold and bright illumination of digital technology will highlight the menu. Content and graphics too must be attractive to entice the target customers. A kids menu could be integrated along with the regular menu for attracting the target audience. Budget permitting, small yoys, gifts and candies could be distributed as freebies. And all these could be advertised on the digital menu board. The digital signage's cloud based program will enable you to coordinate and update menu content in multiple chain restaurants by a single admin and at real times. Hence, if your stores are located at LA, Dallas and 'Frisco, you can update menu content of all three from New York. 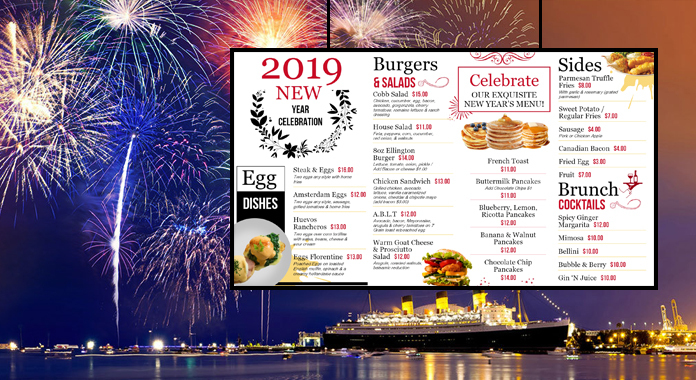 The videos and moving images and playlists could form an integral part of digital menu board marketing. Devise entertaining content and rotate them on the screen. Videos can show demonstrations on some exotic recipes which can entice customers to order. Have a list of sides/add-ons/ combo offers which will enable you to up-sell during the lean hours ( if any) in the two days marking New Year's Eve and New Year's Day. You may innovate on your menu and market new items. Try and discipline liquor consumtion of patrons. This is easier said than done since almost 100% of customers would want to say Cheers! to the year gone by and Cheers! again to welcome the New Year. Engaging customers through various games and competitions could help abate the intake. While your customers and patrons welcome the New Year with much fanfare, we at DSMenu would like to wish you, the restaurant fraternity, a new beginning towards better progress and prosperity. Happy New Year, And Stay Blessed ! !